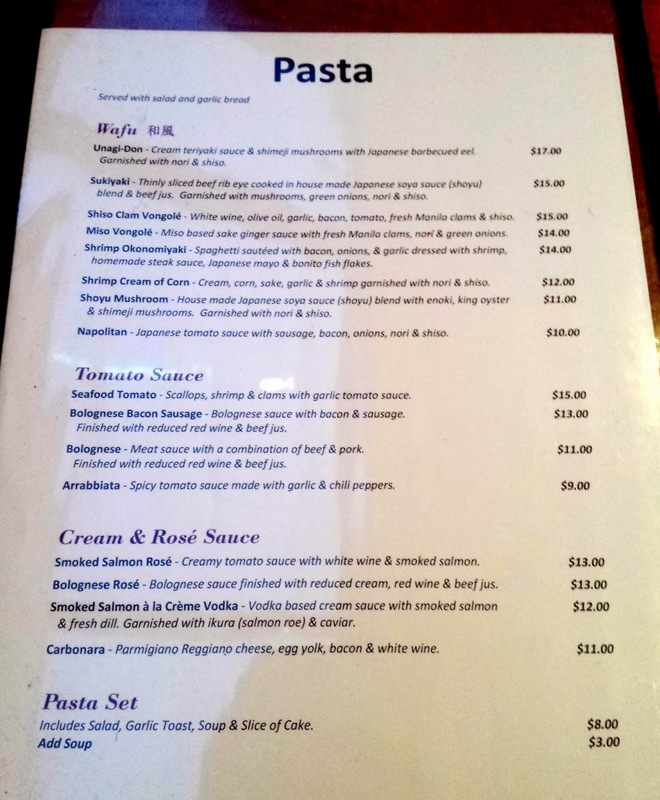 Aside from Shiso Tree Cafe (@ShisoTree) in J-Town I am not aware of any other restaurant in the GTA that serves Japanese-style pasta (please leave a comment below if you know of others!) Japanese and Italian restaurants are a dime a dozen in the city but when it comes to Japanese and Italian fusion, specifically pastas (think unagi don pasta with cream teriyaki sauce or sukiyaki pasta with shoyo sauce garnished with shiso, nori and green onions) this little cafe at 404 and Steeles pretty much dominates the scene. Western-influenced cooking in Japanese cuisine is not a new phenomenon. Here's a bit of history. For many years, Japan isolated themselves from other international cultures. However at the beginning of the Meiji Restoration (around 1868), national seclusion was eliminated and the Meiji Emperor declared Western ideas as means to Japan's future progress. As part of the reformations, the Emperor lifted the ban on red meat and promoted Western cuisine (which was viewed as the cause of the Westerner's greater physical size). As a result a style of Japanese cuisine known as yōshoku, or “Western food,” was created and unlike the typical Japanese cuisine at the time, yōshoku relied on meat as a common element (meat = taller). 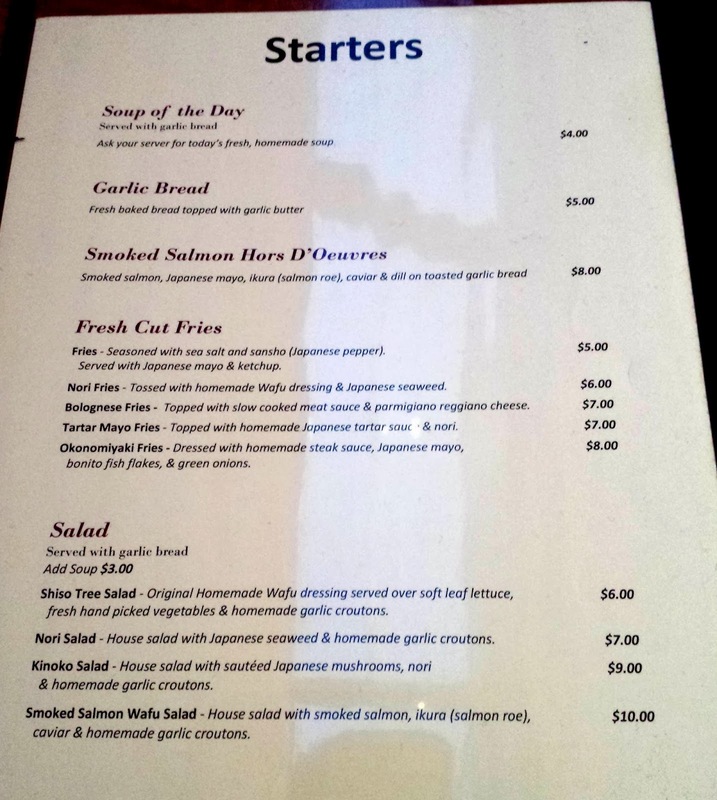 Nowadays yōshoku establishments usually serve set menus with a main entree, soup, and salad. Most provide both chopsticks and cutlery (knives, forks, spoons) so you can choose which works best for you. The yōshoku category is broad, and includes dishes that have become so integral to the diet that many Japanese wouldn't consider them "Japanized" Western food at all, but simply Japanese food. Shiso Tree Cafe in J-Town is a quaint little yōshoku restaurant that specializes in Japanese-style fries and pasta. Shiso Tree Cafe's two-page food menu consists of 5 varieties of fries, 4 salads and 16 pasta dishes plus a soup of the day, garlic bread and a smoked salmon starter. Complimentary salad with pasta entree. Add Soup of the Day with your pasta for $3. A light vegetable soup with bits of bacon. For $8 this ginormous plate of fries was worth every penny - all those fixins' were off-the-hook. I especially enjoyed the thick, sweet steak sauce and the dried bonito...so much umami! Thinly sliced beef rib eye cooked in house made Japanese soya sauce (shoyu) blend & beef jus. Garnished with mushrooms, green onions, nori & shiso. I really enjoyed the beef here; it was well-marinated and tender. Similar to traditional sukiyaki, the sauce in this dish was more like a soup or broth (which is why it doesn't thoroughly "coat" the pasta like a normal sauce would). Nonetheless, the slightly sweet shoyu "sauce" was full of flavour and very appetizing. This pasta was a Valentine's Day special so it's not on the regular menu. Without question, the star of the plate should be the uni but sadly, its beautiful flavour got somewhat lost in the overly thick and rich sauce. This pasta would have been a lot better with a less gooey and heavy sauce. I am looking forward to going back to Shiso Tree Cafe to try their other pastas (and fries!) I've always loved Japanese ingredients and flavours as well as pasta so Shiso Tree Cafe has got me really intrigued. I hope Toronto will open more yōshoku restaurants in the near future.